Although the primary role of food is to provide us with nutrients to stay alive, food has another important role. It provides pleasure. Anything we have to do multiple times a day should be enjoyable. And while I do enjoy eating fruits, vegetables, and other healthy foods, I also love to eat sweet treats. That being said, treats are a ‘sometimes’ food in our house. So in order to keep our treat intake down to an acceptable level, I bake my own. This has three advantages. The first is that I only have so much time in my crazy schedule to make baked goods. That means we don’t have them too often. The second is that I know exactly what is going in to them. No questionable ingredients in our house. 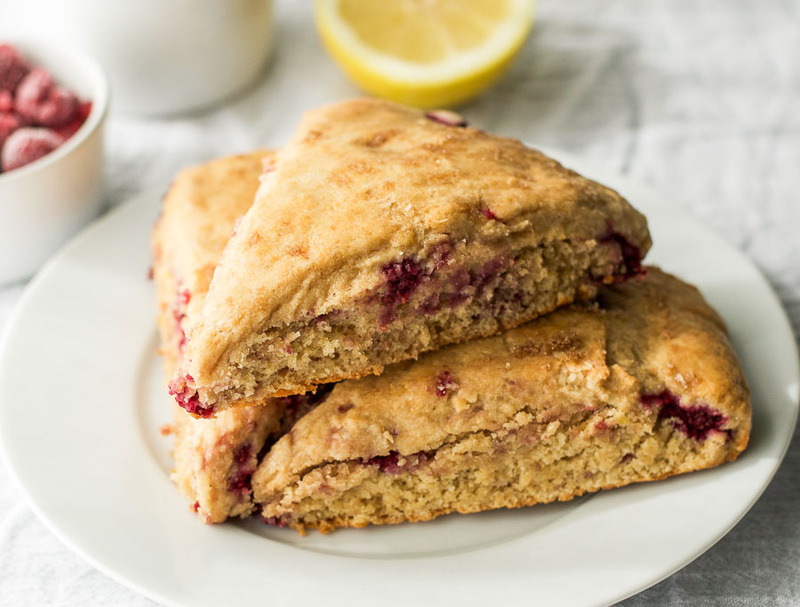 The third is that I can tweak the recipes to make them healthier, which is exactly what I did with these whole wheat lemon raspberry scones. Scones are a very simple and versatile baked treat. They are easy to make and can be altered to suit your preferences. You can add blueberries, raspberries, cranberries, or even chocolate chips to tailor them to your taste. I wanted to make a sweet treat with some extra fiber. So I used whole wheat flour and added raspberries to increase the fiber content. I also wanted to make sure there was some protein to make them a more filling snack. That is why I added yogurt to the recipe. 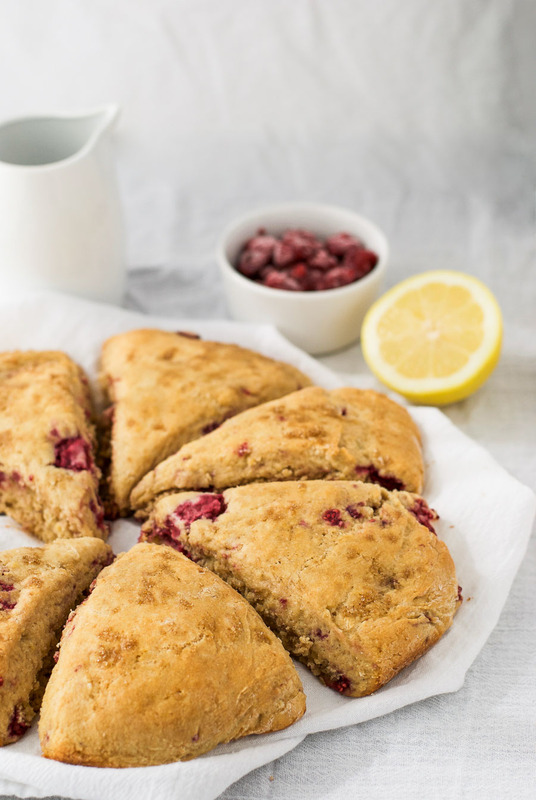 The result was these light, tasty, and satisfying whole wheat lemon raspberry scones. Preheat oven to 375F (180C). Mix the flour, sugar, baking soda, baking powder, and lemon zest in a large bowl. Cut the butter into small chunks, add it to the dry ingredients, and cut it in with a pastry blender (or rub it in with your fingers until it resembles fine breadcrumbs). Whisk together the egg, yogurt, and milk, and stir into the dry mixture until a dough forms. Transfer the dough to a lightly floured surface, and briefly knead. If the dough is too wet, add a little extra flour while kneading. Pat the dough into a flat disk about 2 inches thick and cut into wedges. Transfer the dough to a parchment-lined or lightly greased baking sheet. If you want crispier scones, separate the wedges a little. If you prefer them soft, leave them touching one another. Brush the tops of the scones with the 1 tsp mlk. Sprinkle with 1 tsp brown sugar. Bake in the oven for 25 minutes, or until light golden brown. Very tasty! How long do these keep? They should last 4-5 days in an airtight container, but they are tastiest on day 1 or 2. Just came across your site via healthy aperture and love it. Your pictures are beautiful and I am right there with you on the everything in moderation approach. We also bake our own treats (at least most of the time). Thank you for your lovely comment Maria. Yes, the home baking is only most of the time here too. Sometimes there just aren’t enough hours in the day. WOW these scones look incredible! 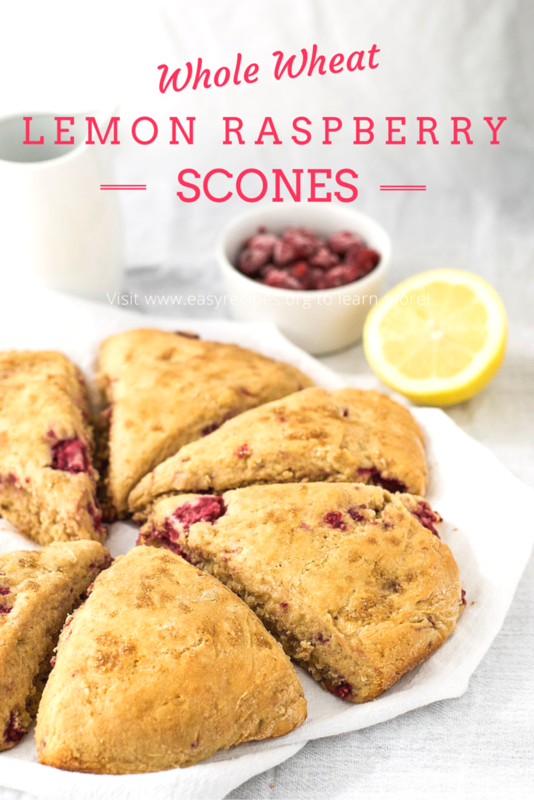 Im loving the lemon and raspberry combo! From pics it looks amazing..infcat I would love to try this recipe..Could you tell the percentage of fat it contains? Thanks for your comment. I have now added a nutrition facts label. One scone contains 20% of your total daily fat (based on a 2,000 calorie diet) and 39% of your daily saturated fat allowance. I have to say, though, that one whole scone is pretty big. While I only cut them into 8 pieces to cook them, I usually serve half a scone at a time.